Toshiba B 882 - Thermal transfer, 305 dpi, 8 ips, 8.40" print width, parallel & serial interfaces. TEC's superb print quality is maintained at a level expected from a leading printer manufacturer. Thermal transfer/Thermal Direct Printer continues TEC's tradition of producing printers that lead the market in price and performance. Featuring 305 dpi and print speeds of up to 8 ips this printer also incorporates ribbon save and the ability to handle a wide range of media types. 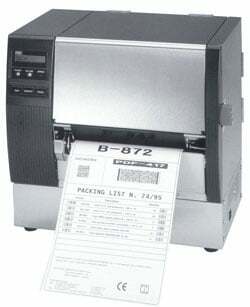 The Toshiba B-882 is also known as B-882	or B882	.